Hello! 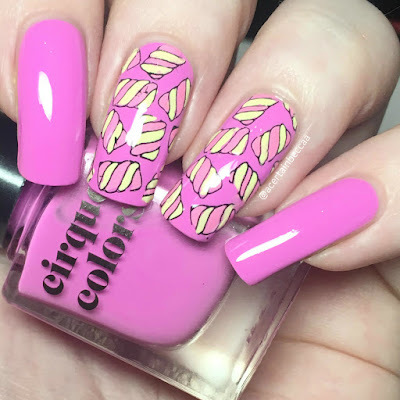 Today I have a fun nail art look to share, using one of the polishes from the new Cirque Colors Vice 2017 Collection (partial collection swatches and nail art here). 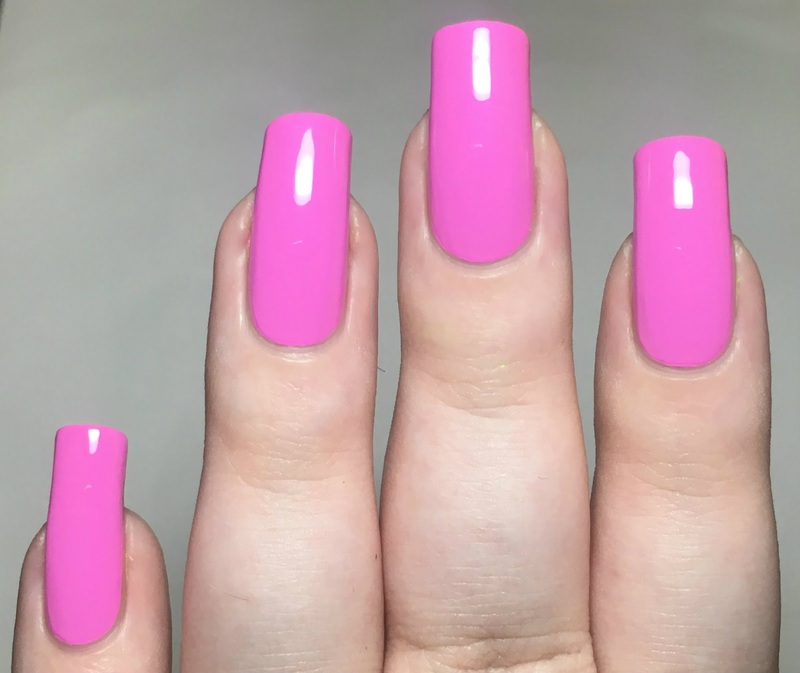 I really loved all three of the polishes I shared, and think they'll become a staple for Summer nail art. 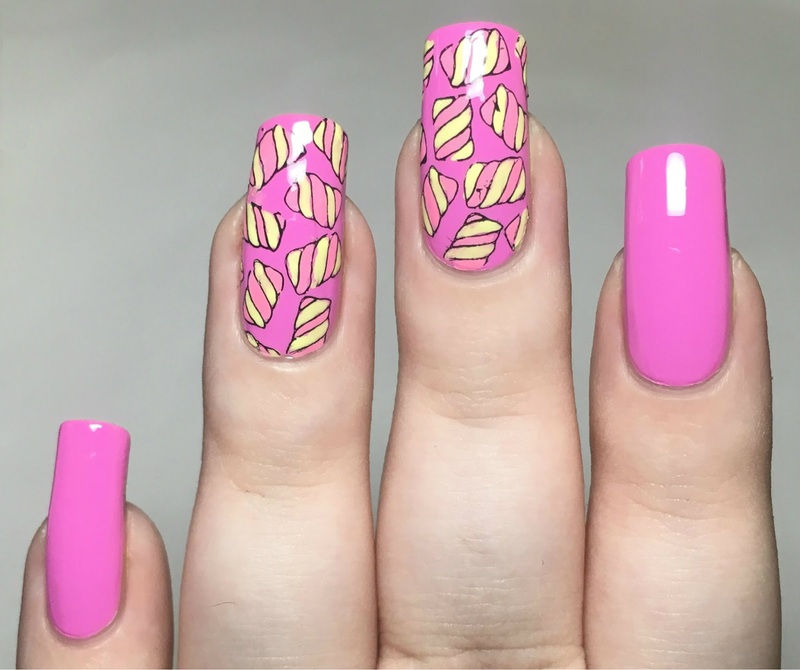 I decided to pair one of them with a Sugar Bubbles plate to create the mani below. Read on for more info! 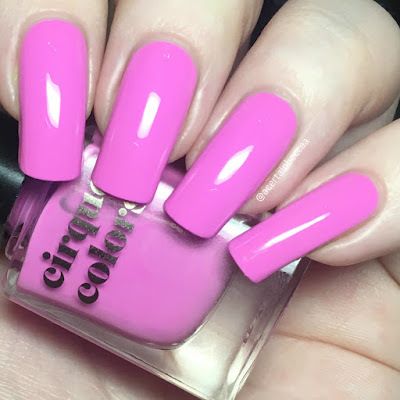 I started with a base of Cirque Colors 'Socialite', a neon lilac-toned pink creme. I absolutely love this colour. Below is two coats with topcoat. For the marshmallows, I used Sugar Bubbles plate SB 055. I picked this up in a recent Rainbow Connection haul, it's just so cute and fun! The marshmallow image was the first one that caught my eye, so that's what I went with. I stamped using Hit The Bottle 'As Black As Night', and then coloured the image in on my stamper head using Pretty Serious Cosmetics 'Little Duckling' (yellow) and 'Fluffykins' (pink). I then stamped my marshmallows onto my middle finger, and repeated the process again for my ring finger. I finished with a coat of topcoat. What do you think? I really didn't want to take these off, I loved them so much! The pink in the marshmallows doesn't stand out from the base colour quite as much as I would have liked, although the difference was more obvious in person. I have a feeling both the Cirque polishes and Sugar Bubbles plate will feature in future posts! All items used are from Rainbow Connection. The full Cirque Colors Vice 2017 Collection releases this Wednesday (21st June), and will be available here.